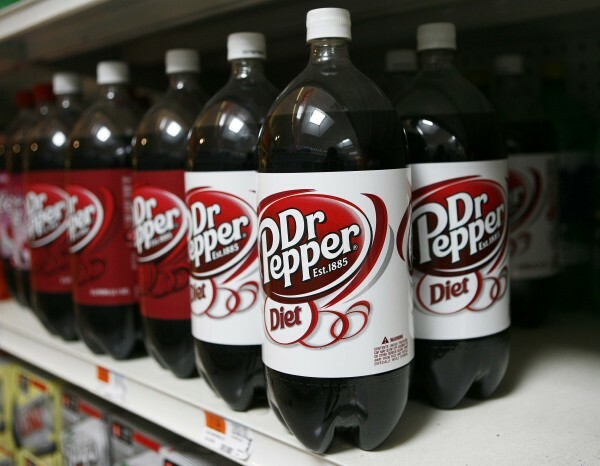 Dr Pepper bottles are seen inside a store in Port Washington, New York in this May 7, 2008 file photo. What gives Coke, Pepsi, Dr Pepper, A&W Root Beer and Malta Goya their rich brown coloring? Caramel coloring, the artificial coloring that is added to these products, is the single most used food coloring in the world, according to a 2013 report from market research firms Mintel and Leatherhead Food Research. It may be caramel in color, but it in no way resembles real caramel. Of concern is that some types of this artificial coloring contain a potentially carcinogenic chemical called 4-methylimidazole (4-MEI). In 2007, results of a federal government study showed that 4-MEI caused cancer in mice and the International Agency for Research on Cancer determined the chemical to be “possibly carcinogenic to humans” in 2011. To date, there is no federal limit for levels of 4-MEI in food and beverages. California requires that manufacturers label a product sold in the state with a cancer warning if it exposes consumers to more than 29 micrograms of 4-MEI per day. For soda, the exposure would come from consumption. The decision to use 29 micrograms as a cutoff point was made since that is the level determined to pose a one in 100,000 risk of cancer. Some researchers believe that even 29 micrograms is too high, since it is possible to get more than 29 micrograms in just one can of some types of soda, and even if a soda contains just half that amount, many people consume at least two cans of soda daily. The caramel coloring is deliberately added to soda. It does not make the soda taste any differently, so such an addictive should not pose a risk to the consumer. A negligible risk of 4-MEI is considered to be 3 micrograms or less per can. Consumer Reports tested 81 cans and bottles of various brands of soda from five different manufacturers between April and September of 2013. The products were purchased from stores in New York and California. Again in December 2013, 29 new samples of products that originally tested above 29 micrograms per can or bottle were tested again. Results of the study weren’t such that one product could be recommended over another. Both sets of tests did reveal the samples of Pepsi One and Malta Goya to have levels of 4-MEI that exceeded 29 micrograms. On average, Coke, Diet Coke, and Coke Zero came in under 5 micrograms of 4-MEL per can. The products that were purchased in California did not have a label warning of the cancer risk associated with consuming the product. Kenneth Portier, managing director for statistics and evaluation at the American Cancer Society, says the International Agency for the Research of Cancer has assessed 4-MEI as “possibly carcinogenic” based on animal studies. There is, however, no direct evidence that the chemical has health effects on humans, he says. The lack of strong scientific evidence is not uncommon for suspected food-associated carcinogens and this does not mean there is no risk, it’s just that not enough is known at this time to say what the risk is. As a result of their investigation, Consumer Reports is petitioning the Food and Drug Administration to set a federal standard for 4-MEI and to require manufacturers to list the type of caramel color they are using in the product ingredient list. There are 4 types of caramel coloring that may be used and the two made with ammonia compounds can contain 4-MEI. Manufacturers can use the term “artificial color” interchangeably with “caramel color,” so it isn’t clear what you are consuming. The FDA has said that it doesn’t believe that 4-MEI from caramel color at the levels that are currently in food present a risk. They appreciate the work that Consumer Reports has done and are currently doing their own tests of foods and sodas for 4-MEI. They are reviewing new safety data on 4-MEI to decide if any regulatory action needs to be taken. If you want to limit your exposure to 4-MEI for now, the option is to consume few if any products that list ‘caramel color’ or ‘artificial color’ on their labels. It is possible for manufacturers to reduce the amount of 4-MEI in their products right now, and since it doesn’t add any flavor, why don’t they do this? The best way to limit your exposure is to stop drinking soda. Research has shown regular and diet soda to increase your risk of developing diabetes. Soda provides no nutritional benefit and it replaces the consumption of more nutritious products. An occasional soda is acceptable, but if you are consuming six sodas a day, what is it that you are displacing when you are drinking this much soda? It doesn’t have to be all or nothing, just drink less.